In her newest artistic oeuvre Ursula Heindl accompanies Magellan on his voyage around the world. From start to finish–including all preparatory time–it lasted from 1517 to 1522. Magellan–The World Is Not A Disk is the titles of this series. Background information: this is in the time of Martin Luther; the era of Raphael, Tizian and Dürer; Munich was ravaged by the black plagu;, the Spanish discovered and destroyed the empires of the Aztecs and Mayas and the Catholic Church defended its opinion of a two dimensional earth. The idea to go beyond the borders of the well-known world, to sail beyond the horizon was unthinkable. The unknown was considered to be an ocean of darkness where ships would burn and their crew end in the realms of Satan. Then came Magellan attempting the unthinkable by sailing into the unknown–into a new world. Ursula Heindl follows Magellan and we follow her in his steps into her paintings; paintings that are called Agana, Puerto Piramides, Galpone or San Clemente. Everywhere, where modern art calls its home, they want to hang – exhibiting themselves to critic and giving pleasure to those appreciative of art. 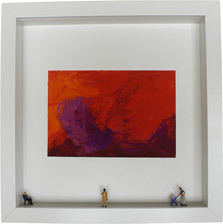 They want to be displayed in public viewing rooms and in white cubes they want to be viewed by people interested in art. Often someone photographs them, sometimes spectators stand in front of them rapt in thought – often passing through for only a short moment – lasting just the blink of an eye. This is what paintings dream of. is a word-mixture of cultural monument and memorial, usually not used in combination. Ursula Heindl made her decision for this word quite consciously, as it describes the concept of her exhibition to the point. Both words are expressions for special places: mostly places of contemplation, often consecrated and even sacred, sometimes besieged and conquered by blood-shedding or they are places that express their genius loci to some degree by tranquility. Sanchi is a Central Indian place name where some of the oldest stupas are situated. Palitana is a town-like temple complex in Gujarat, India, built by Jains, a religious community. Samarra in present-day Iraq could be the first early Islamic mosque and is also known as 'Abraham's Temple'. 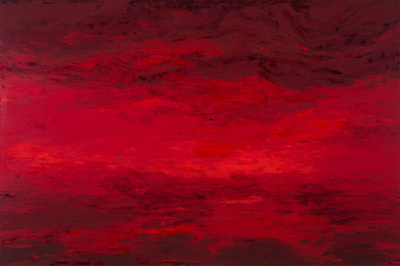 Without even thinking of any specific place, thus, without 'picturing' it Ursula Heindl creates her paintings. Only when they are finished, she christens her works, sometimes months after their completion. The context to the geographical places rests entirely on Ursula Heindl's intuition, which is based on a state or a sentiment for the feeling to be in that special place. Not always such subtile feelings lead to the paintings' titles, sometimes wrath and anger are the link from a painting to the geographical location – it is a panoply of motives just like the range of colors. Within the color spectrum Ursula Heindl has specialized in the color red, just like a scientist who focuses his research in one field. Not for nothing she chose this color; in nature, red often signals danger, it is the children's favorite color and in nearly all cultures does it have a special meaning (such as blood, wealth, joy, life, birth, etc.). 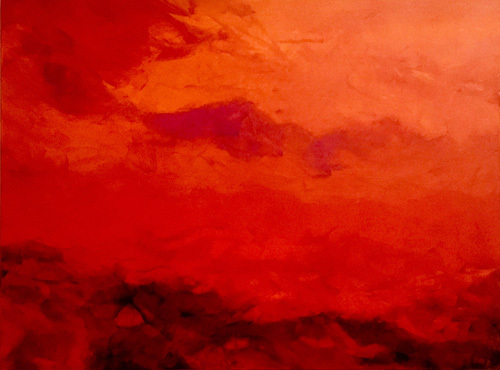 By using all shades of red Ursula Heindl puts her focus on the power of the natural world, the water, the mountains and the clouds in the sky. She regards her painting with deep respect and great love for nature and its light as well as for its colors; she regards painting as a metaphor for this nature and, thus, as a change and transition of these natural powers and energies. In Ursula Heindl's paintings nature is depicted as an active process, therefore some of her paintings are dramatic, while others have an inner balance and many contain both elements. Their main features are their intensity and the colors' expressive power, the fascinating perspective and the view into the spacious distance. Vézelay is a French pilgrimage sanctuary, the abbatial church of which was the starting point of Richard the Lionheart's third crusade. Saiho-ji, is a Buddhist Temple in Kyoto, Japan with a famous moss garden. Borobudur is a Buddhist temple in Java, Indonesia. Durham's cathedral is considered to be the most magnificent monument of Norman architecture in Great Britain. Chan Chan, the adobe structures of the 28 square kilometers big Chimú Capital, situated on the Peruvian Pacific Coast. Abomey in today's Benin with its royal palaces of local monarchs and slave traders. St. Peter an der Sperr in Wiener Neustadt, Lower Austria was built in the 14th century and was profaned in the 18th century, however what is still in existance is its architecture. 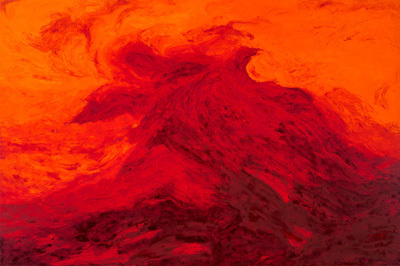 Consequently as a cultural-memorial- monument, this 'church' is the ideal exhibition venue for Ursula Heindl's paintings. I regard my paintings with great respect and a deep love for nature, its light and colors. In this manner I consider my paintings as a metaphor for nature: a variation and transformation of the natural forces and energies – nature as a vigorous process. I am not a landscape painter, who depicts nature on his easel. On the contrary, I contrive the landscape myself. By using all shades of red my focus is entirely on nature's magnitude – the power of water, of the mountains and the clouds in the sky. Natural disasters, freak weather, the appearance and disappearance of islands make us aware of the elements' stunning energy. I am at the same time impressed, fascinated and shocked by nature's elemental force. 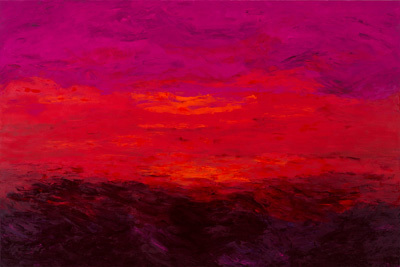 The impression of some of my paintings is dramatic, some others appear rather calm – many comprise both elements. The principal characteristics are the colors' strength and expressiveness, the fascinating perspective, the spacious 'vista' into the distance. The dynamics of the powerful landscape focus on nature and the tension of a deliberate colorful scenery requires a clarification in form and color according to nature. I am finding all the names of my paintings on the world map – they are place-names – thus, I am traveling virtually. In this manner, I sometimes follow legendary travels. Always looking for baroque dramatics I finish my virtual trips on the side of the sea, in the mountains, on small islands or the vast continents. 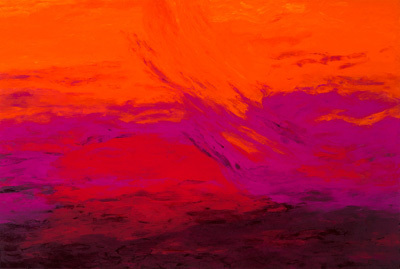 The Viennese artist Ursula Heindl regards her abstract paintings as a "research trip" into the world of color. Beside the color green, red is in the center of her color-expeditions and she is employing it in all its shades, ranging from light to dark, from inner sensitivity to overt expressiveness, from subtlety to pure energy. In the beginning of the 1990s she distanced herself from square pictorial surfaces and turned to the ellipse as a baroque and organic form. 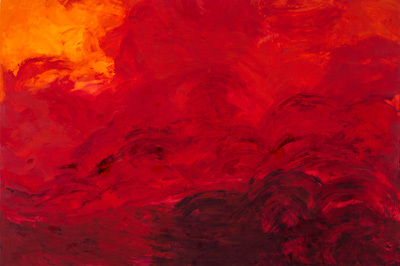 Heindl's flaming red "cloud-paintings" combine the artist's sensuous brush stroke with dynamic coats of color on top of each other and with intertwining layers of colors; thus, providing the surface with a three dimensional depth as well as an haptic materiality. Her paintings remind the viewer of the earthly elements and forces of nature just as of holy references to heaven and hell. By presenting the paintings in the interior or al fresco in a free and suspended manner, they make a reference to the space they are in where they blend in or become an optical confounding element. In this way, they make us aware of the real spatial conditions and also broaden the imagination while watching them. 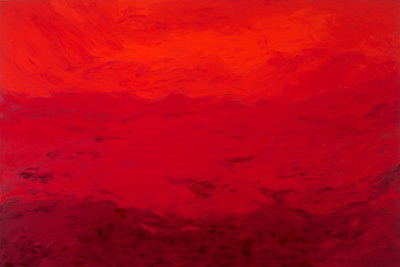 [Ursula Heindl's] paintings are like a research trip into the realm of color. 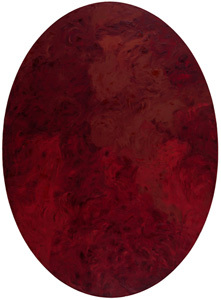 She works in an old technique – oil on canvas or wood and often uses the form of an ellipse, which is for her a form of an organic origin and represents an organic starting point and seems baroque. 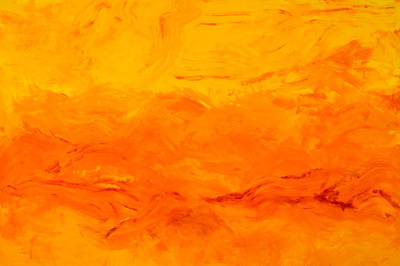 In her personal brush stroke she applies color with obvious joy for the sensual onto the image carrier. This methodological peculiarity is a way to create light and space in a distilled form. The message are the paintings themselves. ". . . when they do not look three dimensional, they are a failure . . ."
Classical panel paintings, or recent computer art, even the dearly beloved screen, they all have something in common: the angle of 90 degrees. Towards the end of the Middle-Ages, the paintings were freed from the walls, but still kept their 90 degrees angles that initially was the invention of the architects. (n. E. Friedell) and which is the umbilical cord connecting mural- and panel-paintings. It conjoins all paintings with architecture and has become part of our consciousness. In this manner, all classical frames and considerations of composition in the domain of paintings and graphics are subject to this principle of organization. There is hardly any other topic in art world that divides the factions in such a way as the 90 degrees angle panel painting. Stigma or nimbus – this is the question. Ursula Heindl has distanced herself as far as possible from the 90 degrees angle. She is too intelligent not to know that her elliptic formats must be seen within an old painting tradition. 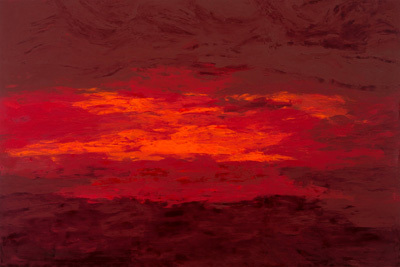 However, she does not embark on a discussion with the old masters of the Baroque. She reaches further back, greeting in her polite manner Titian, looking carefully at the way he captures light – now the master is smiling – and she continues her way back in time until she reaches the primordial mother of all painters: the wall. Rock faces, brick- and stone-walls, just as the walls of heating houses, they all serve as her means of transport, but not as her base coat. She confuses the viewer by carefully intermingling space and surface within her green and red palette and by finally severing the seam between the beginning and the end of the image with a hand, as precise as the one of a surgeon. 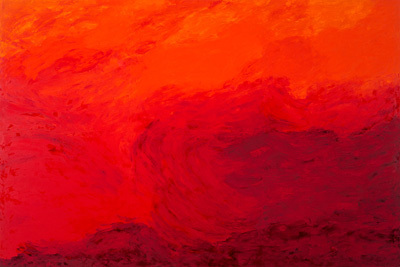 Asking the most rigorous critic, he would say: "Ursual Heindl does not paint she shapes" – now she is smiling.